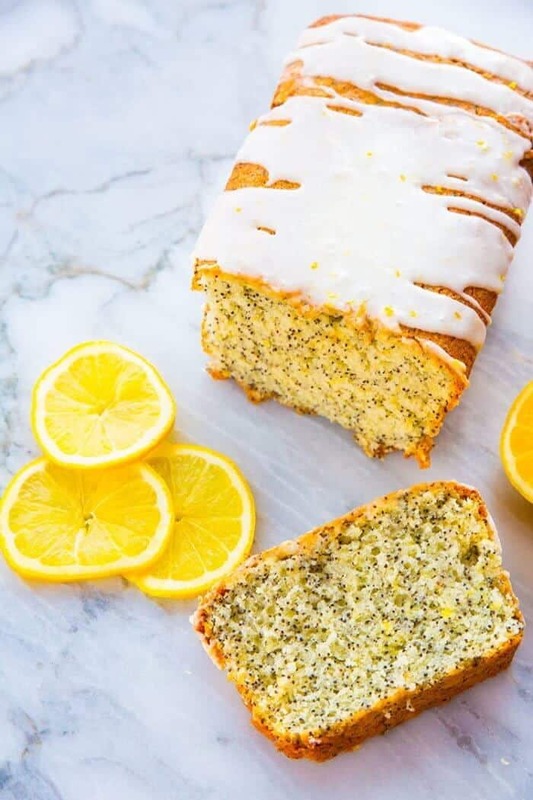 This Lemon Poppy Seed Loaf Cake just shrieks “hellooo spring!” Yes, it is time to start baking with all things lemon while still enjoying our soups and stews for the winter, while eagerly awaiting the day when those first little shoots of green come out in spring. Can you tell what kind of mood I’m in lately? It’s always reflected in my baking and recipes! I put this lemon poppy seed loaf cake under my dessert category as well here on the website, because let’s face it, it’s really a loaf cake. When we call things “loaves” we are really trying to convince ourselves that it’s a little bit healthier because we baked it in a loaf pan, hahah!! You know it’s true! 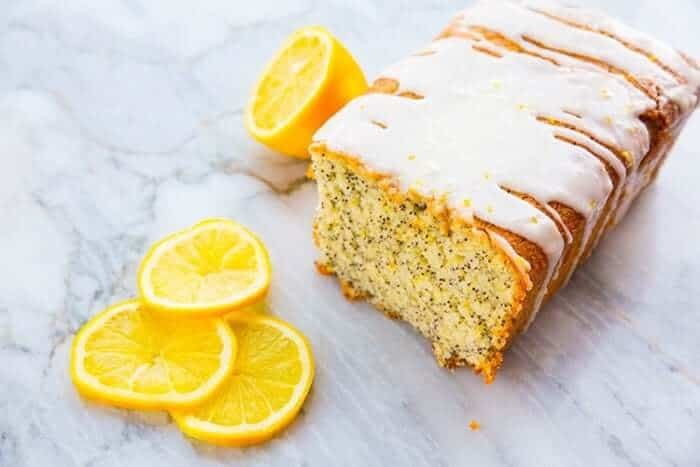 While this lemon poppy seed loaf cake isn’t that bad, it is a treat, there is quite a bit of white sugar in it and that lemon icing glaze? Ohh yah baby. You don’t want to skip that! That lemon icing glaze is the most popular on my website! 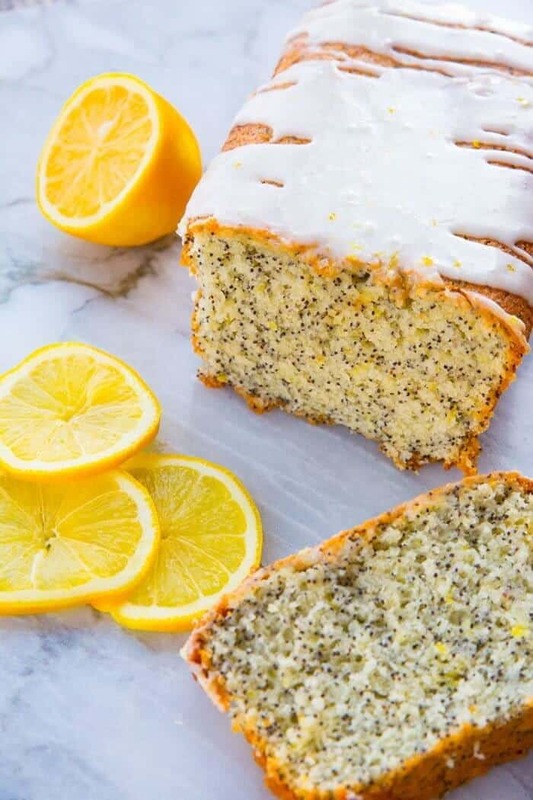 Can I freeze lemon poppy seed loaf cake? This recipe makes two loaves so yes you can totally freeze this loaf. Make sure to wrap it up in a couple layers of plastic wrap and then I always wrap it in tinfoil. This is how my Grandma used to wrap up her baking. The plastic wrap will keep the moisture in and all of the freezer “smells” out of the baked goods, but the tinfoil is actually what is going to keep the freezer burn from happening. Make sure not to skimp out on either the plastic wrap or the aluminum foil, when you go to all this effort baking the loaves don’t ruin it by tossing it in the freezer unprotected! It will last for 4-6 weeks in the freezer. Don’t skip the Lemon Icing Glaze, it literally makes the cake. Er, the loaf. Lemon loaf can brown rather quickly and bake up to be a dark cake. I suspect it’s people’s ovens OR the cake pans that they are using. If you notice in the video I use one of my vintage Pyrex loaf pans, I find that they work better than metal. I think that metal loaf pans are part of why lemon loafs get too dark. Try a glass cake pan and turn your oven down 10 degrees if your lemon loaves are turning too brown. You can also bake this lower and slower if you have trouble with your loaves getting too dark. Try turning it down to 325 °F and see what happens! These are some of my very favourite loaf cake recipes! 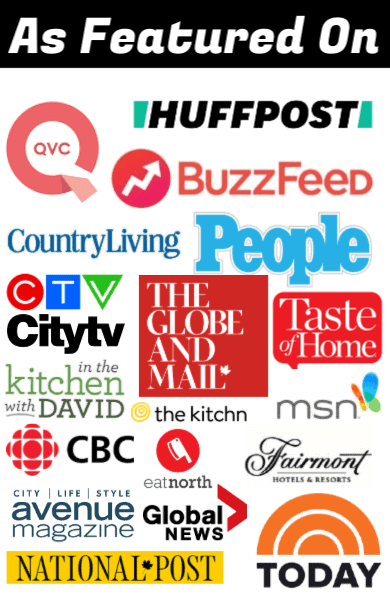 Try some of these if you are looking for more ideas! Happy Baking! If you have any questions leave them in the comments below! 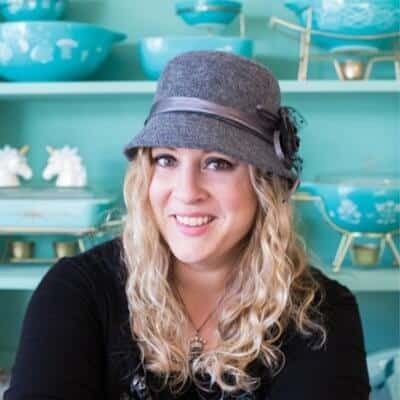 Pin This to Your Desserts Board and Remember to FOLLOW ME ON PINTEREST! 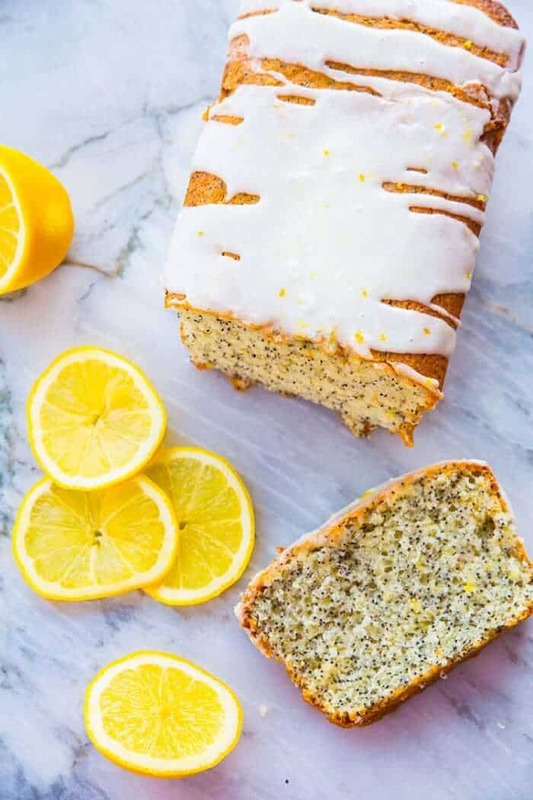 Lemon Poppy Seed Loaf Cake with Lemon Icing Glaze, perfect for your springtime baking! Preheat your oven to 350 °F. Heavily grease and flour two 9x5 inch loaf pans and set aside. Mix the poppy seeds, lemon juice, lemon zest and yogurt together. Set aside. Beat in the eggs, one at a time, until fully incorporated. Sift together the flour, baking soda, and salt. in a medium sized bowl. Add into the butter mixture and mix until combined. Add the sour cream poppy seed mixture to the mixture. Mix until just blended. Pour the batter into the prepared loaf pans and smooth the tops. Bake in the oven for 50 minutes or until browned and a knife inserted in the center comes out clean. Cool on rack for 15 minutes before turning out of pans - this will help prevent them from sticking in the pans. This makes two loaves of lemon poppy seed cake, so you can freeze one for later if needed! I love lemon flavor! Love this! Surely must try! That looks so good, I want a huge slice right now! This lemon loaf cake will be perfect for a summer weekend afternoon tea! I wish I had a slice right now! Such a classic dessert! Calling it a loaf allows you to eat more than one “slice” at a time too! I can’t wait to try your version! Lemon loaf cake is one of my favorites! I am definitely going to try this recipe! It looks stunning! I would love a slice of this lemon poppy seed cake!! It sounds aahhmmaaazing!! This looks lovely! Not much better than this classic, and the lemons are perfect right now! This is one of my favorite types of quick bread! I can’t wait to try your recipe! I would love a slice or two of this cake! Went on your website to get recipe and saw the lemon bundt cake ……..
Well kids theres always tomorrow right!!! !